Belle On Trend: Flow-y, Tassel'd, Peplum Loft Tank for 50% off + My Bff's Visit! Flow-y, Tassel'd, Peplum Loft Tank for 50% off + My Bff's Visit! Megan and I have been best friends for decades-- literally. We met at West Blvd. Elementary School in the early 90s, but she was whisked away to a different elementary school because of neighborhood boundaries. Sad!!! However, we rekindled immediately in our matching blond-bowl-cut-and-braces middle school days, and we remained friends throughout high school, Miami of Ohio for Megan and Saint Mary's for me, Case Western Dental School for Megs and moving to Chicago & getting my masters from Concordia University for me. I always laugh because I truly HATE and fear talking on the phone (shocking, I know, because I can talk in front of teens all day without a prob, and I like to make friends with anyone who is breathing), but Megan is programmed into the new car's "calling" thingy, along with my mom, dad and Mike. I can talk to Megan and catch up for hours, which is huge for a phone-a-phobe. (Funny story: when Mike and I had our first phone call when we started "talking", I had two sticky notes full of topics to ask him about/keep the convo going. We talked for 51 minutes, which was miraculous because I was soooooo nervous. Haha!). Over the weekend, I was lucky enough to have a visit from Megan and her sweet sis, Kimmy, who is basically my lil sis, too! I saw this tank top from Loft in one of their little catalog mailers, and I had to have it. It sells out really quickly, but then they typically replenish it. The back detailing is so cute because it's all criss-crossed and adorbs. Also, the tassels are what sold it for me! Right now, Loft is having a 50% off sale, so HURRY! Use code: sparkler for the deal. I also love this option for an alternative top! Or additional, since these prices are awesome! $25-30 for a summer tank is really affordable/reasonable! ^^ How pretty are these sissies? I went with an XS for this tank, and I am glad I did. I am typically XS from Loft, only because it runs a bit bigger. It's flowy and roomy, so you should definitely size down. 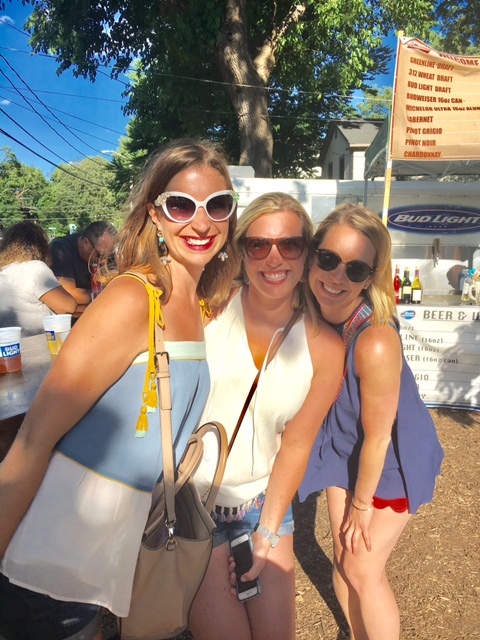 We had so much fun checking out the Swedish Days Festival in downtown Geneva. I highly recommend Chianti's and their famous garlic crab pasta! 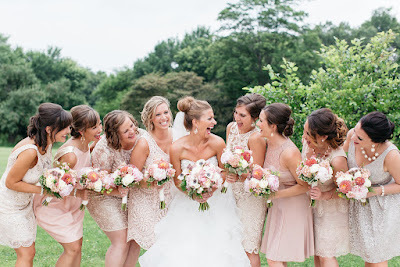 I remember at my wedding, I had all my bridesmaids do "fake laughs" for a pic that turned into us laughing so hard in real life. Then, as a bridesmaid for Megan and Jimmy's wedding in August, I used the technique. I am telling you: it starts fake, but then you die laughing due to the absurdity. Try it! Megan and I opted for jorts, and Kimmy wore the J. Crew Factory scalloped shorts that I am so obsessed with. Swedish Days is so cute in DT Geneva! I love our idyllic little town. More flowy tanks to scoop up this summer including my favorite striped tank from Loft that is on sale for $20!! Remember, use code: sparkler for 50% off everything today at Loft! Our weekend with Megan and Kimmy went way too fast! It was so great to have her visit. I can't wait for another Columbus trip or Geneva trip! Well, I'd say that's a trio of nothing but fun, sass, sweets and true beauty!!! And yes, LOVE that precious top of yours. You're darling as can be!! YES to a little rain on our pretty posies too! Thank you, Andrea!!! You're so sweet! It's on sale if you are in the market!! 50% off today! Oh yes, the rain is so helpful right now! I totally agree. Plus it makes me really productive inside the house. lol! Second, I love that you had a post it note of topics to talk about with your now hubs! Hahaha 😂😂 that is awesome. And lastly, glad you had a nice visit with your friends, that's always so nice! Gotta love friendships that last over time! Thank you so much, girl!! You are so sweet!! Yes, omg, a post-it for my now-husband! hahaha! Thank God the post-it worked! LOL! Thanks so much; I totally agree. It's amazing what true friendships can outlast-- different states, different jobs, and so many years! Thanks again for reading! OMG! So much fun with friends!! I need that top...super cute!! And I have the Factory scalloped shorts-get them. So cute!! Oh and I totally have the same feeling about talking on the phone...I HATE my voice! LOL So glad you found my blog, so now I can read yours!! Have a great day! Omg, yes you need it! It is $29 right now!! Omg, I have the shorts too- hahaha! In black!! I am so happy you share my sentiments about the phone; I feel the exact same way! And yes, I put you on my reading list! yahoo! Have a great day and weekend! Awww thank you so much for your kind comment!! Loft's sale happening right now (50% off the whole store) is amazing!! Check it out! I just went yesterday and did some damage. LOL! Yay to lifelong friends for sure! Thanks again for stopping by Rox-Anne!